Creating a space for graduate education to support the unique needs of you, our grad students is so important. Grad students are not just “older” undergrads. You are unique individuals creating and discovering new knowledge that impacts our nation and the world. It is important to create a space or place no matter how small or large where grad students know they are valued and can find their voices. Creating a space is about creating quality experiences for our grad students. As Grad Deans and faculty, we must not be afraid of disruption. Our charge is to lead change. It is important for grad students to be heard. Their voices and messages provide great insight and we need to listen. 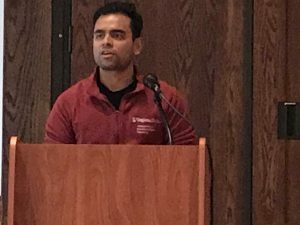 Grad student voices can be overshadowed on campuses where the majority voice is that of the undergrad. Yet – as I always say – it’s the grad students that are the “legacy of our universities.” Their voices have always caused me to stop and reflect. We need to create a space where their voices can be heard, and we can listen. Recently, I had the chance to hear the voices of grad students at another university. I listened and was moved. I will share some of the insight I learned from their voices. In that space, I heard about the importance of asking questions. While I know that to be true, I heard it in a different way. 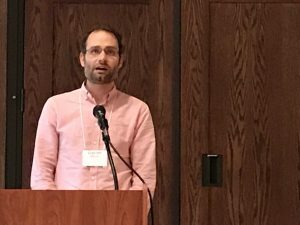 Grad Education provides a venue for grad students to explore new opportunities and to find their real purpose. Questions like “How is the work I am doing supporting my goal for the future?” Statements such as “Touching the future with training I have received so that I can touch the lives of others” through counseling education. I was moved when one grad student spoke about “reclaiming the future.” She was in the humanities and was bringing history and family experiences to new frontiers through song and blue grass. 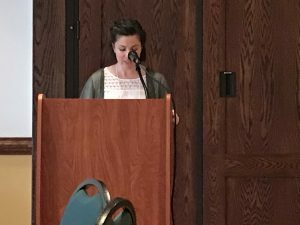 Another student spoke about how she dealt with the transitional nature of grad school. 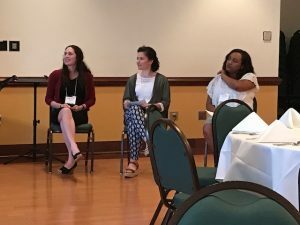 “Everything in Grad School is transitioning.” She spoke about how she first connected with peers in her lab then branched out to her department and through place and space of Grad School, she connected to the university – peers across campus. “Grad school helps one to connect with people at the university level” that she couldn’t do by herself. It was the place and space that made a difference as well as the action she took. She told the audience about how she invited her peers in her lab to spend 30 minutes with her eating lunch. She and others really looked forward to sharing ideas and conversations that wouldn’t be possible if she didn’t take the initiative to connect with them – even if it was for 30 minutes. 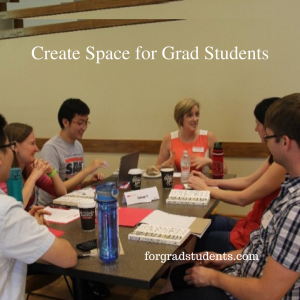 Our grad students are with us for a short time and yet what they give to us is lasting – we all can create space/place (even if it is at a picnic table for lunch) to support our grad students and assist them to connect. We all benefit – from a more inclusive community. 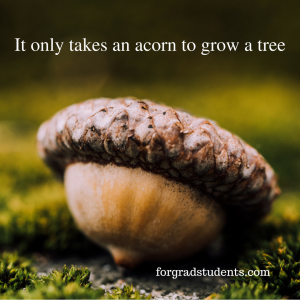 Our charge to lead change begins with grad students, faculty, and Grad Deans to build a culture with new meaningful and relevant program and opportunities – it takes an acorn to grow into a tree. WE all can be that acorn – we don’t have to start out as the tree. Previous Previous post: Fireside Chat: Are we there yet? Or did we get stuck in the “Mud of Dunland”?